I would like to think JOHN (LS376) for all the information and video he has posted here and on U-tube- I wouldn't be writting this without that push. Yes, there will be another 480 HP LS 376 built! Pace Performance of Youngstown,Ohio shipped a 500 pallet to me. Engine, oil pan,oil pickup, windage tray(don't buy)ECU and engine. I have a 2000 Boxster S with dead engine-triple Black. Follow along and learn from my mistakes and successes! I will post when can, but have travel obligations, so this will not be a "Overhauling" speed build. I am doing this on my dime and time, my way. I was at Tech Tactics in Ontario this year-loved Cayman GTS! I am hoping for similar figures for performance at a lot less $$$$$. I read an article by Jim Pasha in Excellence, about 10 years ago- about the Spec Boxster. He suggested that $15,000 for car and $8,000 in mods, you could be racing. So I have determined that this will be my goal, roadworthy,cross country capable with 480 HP in a Boxster S for $23,000 and my time. with hardware and delivered (70X42X62 inch box). I will sell engine minus alternator,A/C compressor,and harnesses and switches to recover some costs. The expansion tank has already been replaced, due to prior leakage. I will do the radiators with CSF all aluminum and all new hoses. The car was a stripped and saved. Mildew on driver door from dead battery. Replaced missing front trunk lid with one from 996. Rear bumper and spoiler from 2004. Sound system console missing- Replaced but not included in conversion cost. About the engine, the LS376,480HP crate engine is now shipped with the oil pan for the Cammaro-wrong for the RH kit. the 2006 Corvette 430 Hp engine has the right one and you can save a lot if you find one in good shape. Above I said don't buy windage tray, Vette magazine recommends the EM-215 crank scraper and baffle windage tray for LS3 from Innovative Racing. That's what I am installing. i will close this with a wish for all - have a healthy and happy new year after your holiday enjoyment. Glad to hear this Bill!!! Looking forward to updates! I've decided to take mine to the final level and finish off the brakes and suspension, I stopped adding up $$$ long ago, but including the car I've probably got a bit over $30K in mine by the time I finish up with this next set of updates which is adding another $3Kish so you are probably pretty close with your numbers. So I'm at work with no sound and I had to edit this down a bit so I just used the last portion of the video... I'm sure people don't want to hear me talk anyway and just want to see the car do its' thing! It is hard to take a non-professional video and get the actual sensation of speed from it so this video mostly includes just the speedo! This is a quick run up in 4th gear from about 60 MPH, what I like the most is how fast the digital speedo starts climbing!!! In total it takes about 6 seconds - and that is just 4th gear!!! Glad to hear about another swap! I'm about seven months into the process with mine, but getting awfully close to that first drive. I didn't want to steal John or Vlad's thunder, so I'm keeping on the down low until I'm finished. The Renegade Kit has some good suggestions, but these are definitely many other ways to solve some of the problems with these swaps. Let us know how you're doing and we'll gladly offer suggestions and / or steal your ideas. One day someone's going to build a total conversion swap kit and make it easy for guys like me to want to pull the trigger and do it! All this cutting of firewalls and rewelding in pieces is not for me. To be honest, that is the easy part!!! It is getting the rest to fit and work together properly that is the hard part!! I was just talking to one of my guys here about pursuing the idea of making a kit, a REAL kit... just talk for now but you never know. It's great to see another person doing the swap so I can gather more info!! Love the Ls3 boxsters seems like the best way to go. Always fun to see modifications.Must be a hoot! Looking forward to your build... will be interesting to see if Renegade updated/enhanced their so called kit since John's build. I almost bought a boxster base on here earlier in the month. It was a nice low mileage 98 midnight blue base with a great interior. Is getting an S really necessary ? 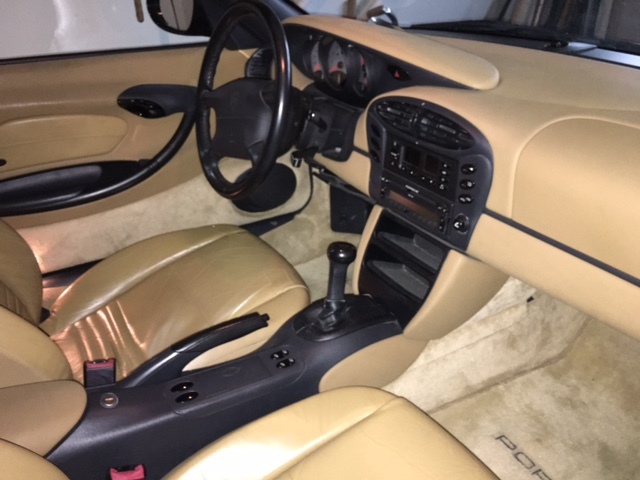 I can source several Boxter transaxles, G86-20 6 speeds With shifters for under $750 each . I would be replacing 15 yr old Suspension with either ROW or PSS9 Kit anyways. I would replace 15 yr old radiators regardless can the new (3) S radiators just bolt into a Boxster Base? I know upgrading base front brakes to S is a bolt on upgrade. What else am I missing? My goal is to start sourcing donor and parts soon. I say yes, start with an S.
First off look at how much you are talking about regarding swapping this and that, only $750 for a trans and another $$600 for used brakes, plus you need rotors. Suspension may be upgraded but I believe the technology behind the S suspension is more advanced then the base stuff although I may be wrong and possibly it is just a matter of replacing shocks. Regardless just with those bits I just mentioned you are looking at over $2000 to put it to "S' spec and let's be honest, there are more then a few "S" cars out there with bad motors which can be had for $5000 or less. Plus S cars are usually going to have better options such as HID lights etc. So my question would be why would you NOT buy a Boxster S to start with? Not a big fan of yellow, but thanks for the info. Looking for color in this order: Silver (polar/arctic), Guards Red, Midnight Blue or Black. Clean interior is very important and I am picky as hell. Last edited by bc993; 01-07-2016 at 02:12 PM. Righty-O. Ok i'll give it to you the color and condition are not top notch but that was one example that took me 30 seconds to find. I know a nice S was for sale on here with a bad motor a few months back for $4K. I think you are missing one glaring point there though... One, the S, has a good running motor, which at the very least I'm certain you could sell quickly for $3000 give or take. The other has a bad motor which is the equivalent of a boat anchor worth $0. So now you are down to an extra $1000 to get your goodies plus you have to swap everything. We could probably go back and forth about this on many examples. At the end of the day you are going to do what you want to do, all I can do is offer my $.02. I gotta side with Jay and recommend an S as well. The conversion is already a massive undertaking and will require 110% of your remaining time and motivation. Adding more to the project can quickly torpedo the progress before you even start. To take something like this on, one needs to be at least a little crazy / messed up in the head. Go with your gut and do what YOU think is right. If you are near Lake Orion and want to see one of these projects in person, I'm ~90% done with my conversion. Send me a PM for details. I'm not sure where you're sourcing a six speed for $750, but something is fishy about that price. They normally go for double that.